Dr. Gilson attended Loyola University School of Medicine in Chicago. His neurology residency was at Mount Sinai Medical Center in New York City. He has been in practice with our group since 1986. He is board certified in neurology and Vascular Neurology by the American Board of Psychiatry and Neurology. He is section chief of neurology at Monmouth Medical Center and Riverview Hospital and medical director of the stroke program at Riverview Medical Center. 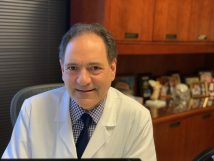 His outstanding service has been rewarded by the APPLE Award from The Foundation of the New Jersey State Nurses’ Association in 2009, by the hospital’s prestigious physician recognition award in 2010, and by the Excellence in Clinical Teaching Award given by Drexel University College of Medicine. He currently holds a position at Rutgers-Robert Wood Johnson School of Medicine as a Clinical Assistant Professor in Neurology. Dr. Gilson also has been named a ‘top doc’ in the New York metropolitan area by Castle Connelly and the New Jersey Monthly Magazine. In addition to his general neurology practice, he evaluates children for learning disabilities for several school systems. He also sees children age 5 and above for a variety of disorders including headache. He also has a love for photography and his partners have graciously allowed him to adorn all available wall space in the office with his pictures.